Are you looking for a low-carb pasta option or grain-free lunch ideas? Perhaps a way to sneak more veggies into your family’s diet? When it comes to healthy recipes, MOMables is great about finding ways to help sneak extra veggies into your family’s diet. Especially in finding new ways to add veggies into kid’s school lunches. We love zucchini. It’s low in calories and carbs and contains no saturated fats or cholesterol. This is great for Mom, who is always attuned to the needs of her feminine figure. ;) It’s also a great source of vitamin A, vitamin C, antioxidants, folates, and potassium. This is great for my daughter and the overall health of my family. 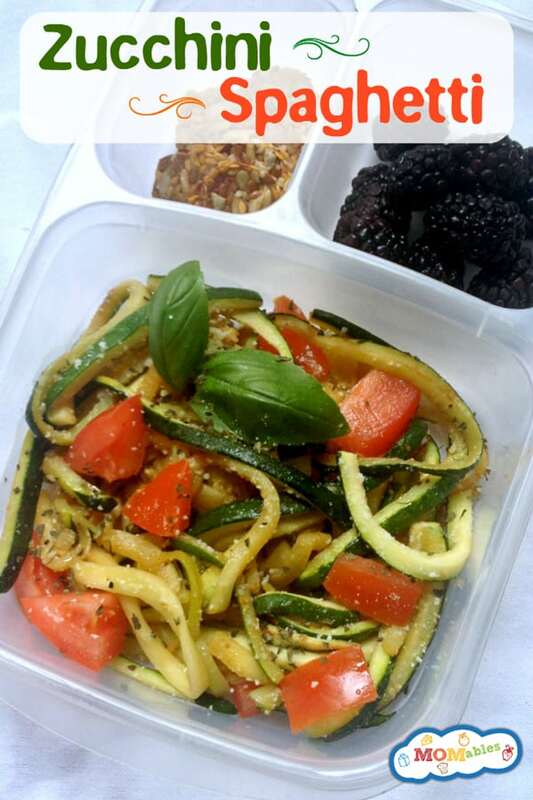 We’ve showed you some amazing ways to use zucchini already: Veggie Lasagna Cups, Pizza Bites, Carrot & Zucchini Bars, Mini Chocolate Chip Muffins, and even in a delish Cheesy Rice dish. All great and simple ways for your family to enjoy this nutritional vegetable! Have you ever made pasta noodles using zucchini? It’s so simple! We’ll show you! The way you make the noodles themselves is really your choice. You can julienne them by hand, thinly slice them using a mandoline, or even by using your everyday potato peeler to slice them into a thin ribbon-size noodle. Some enjoy them raw, but I love sauteing them as we’ve shown here. They’re soft and full of flavor! Giving you the texture of a traditional pasta noodle but without all the calories or carbohydrates. That means no guilt when you load your plate for a helping of seconds! They’re best served immediately and fresh, but they can be packed up for lunch the next day with a little extra Parmesan, fresh tomatoes, and basil. Serve them this way for dinner or with your favorite pasta sauce poured over them. Your family will be amazed at the texture and taste of this “pasta” dish. 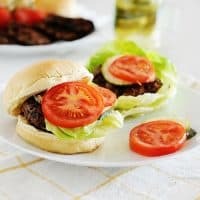 An excellent low-carb, grain-free, and gluten-free option for dining! Use a vegan Parmesan cheese topping to also make it friendly for those on Paleo diets. Enjoy! Scrub and clean the zucchini. Remove the ends, and discard the core and seeds. Julienne by hand or by using a mandoline. In a skillet on the stove, add 1 tablespoon of the oil on medium-high heat. Once heated, add half the zucchini noodles. You will need to cook them in two batches. Add 1/4 teaspoon of the salt and 1/4 teaspoon of the lemon peel. Toss, and cook for 3 to 4 minutes. Halfway through, add half of the basil, and finish cooking until the noodles are soft. Repeat with the second batch of noodles. Optional toppings: Pasta sauce, Parmesan cheese, fresh basil, and/or fresh tomatoes. In a skillet on the stove, add 1 Tablespoon of EVOO on medium-high heat. Once heated, add half your zucchini noodles. You will need to cook them in two batches. Add 1/4 teaspoon of salt and 1/4 teaspoon of lemon peel. Toss and cook for 3-4 minutes. Half way through, add half of your allotted freshly chopped basil (approximately 1/2 – 1 Tablespoon worth) and finish cooking until noodles are soft. Repeat with second batch of noodles. Serve immediately with favorite pasta sauce, topped with Parmesan, fresh basil, and/or fresh tomatoes. Thanks for sharing. 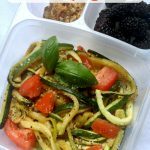 I use a vegetable spiral slicer and my kids are eating vegetable pastas once a week and they love it! I love Zuchini Pasta, i eat it cold with some balsamic vinegar just like a salad.MMMMM!